While applied frequently in physical biochemistry to the study of protein complexes, the quantitative use of analytical ultracentrifugation (AUC) for nanocrystal analysis is relatively rare. Its application in nanoscience is potentially very powerful as it provides a measure of nanocrystal density, size and structure directly in the solution phase. Towards that end, this paper examines the best practices for applying data collection and analysis methods for AUC, geared towards the study of biomolecules, to the unique problems of nanoparticle analysis. Using uniform nanocrystals of cadmium selenide, we compared several schemes for analyzing raw sedimentation data. Comparable values of the mean sedimentation coefficients (s-value) were found using several popular analytical approaches; however, the distribution in sample s-values is best captured using the van Holde–Weischt algorithm. Measured s-values could be reproducibly collected if sample temperature and concentration were controlled; under these circumstances, the variability for average sedimentation values was typically 5%. The full shape of the distribution in s-values, however, is not easily subjected to quantitative interpretation. Moreover, the selection of the appropriate sedimentation speed is crucial for AUC of nanocrystals as the density of inorganic nanocrystals is much larger than that of solvents. 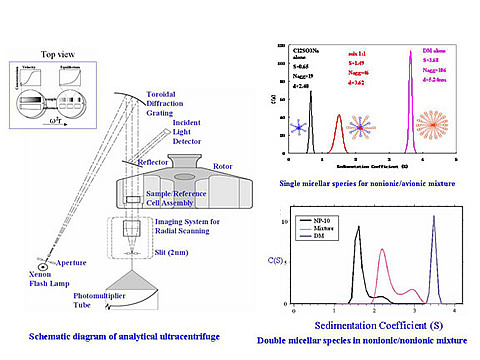 Quantitative analysis of sedimentation properties will allow for better agreement between experimental and theoretical models of nanocrystal solution behavior, as well as providing deeper insight into the hydrodynamic size and solution properties of nanomaterials.